The planning stages for a new project is always so much fun. I pull together inspiration photos, play with color palettes, and spend hours sourcing furniture, fabrics, lighting and rugs. 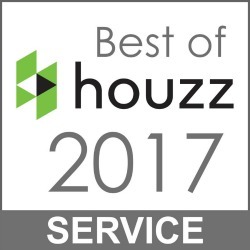 Most of the time I find myself offering several different floor plan options as well as several different color palette options. I love space planning and sourcing! 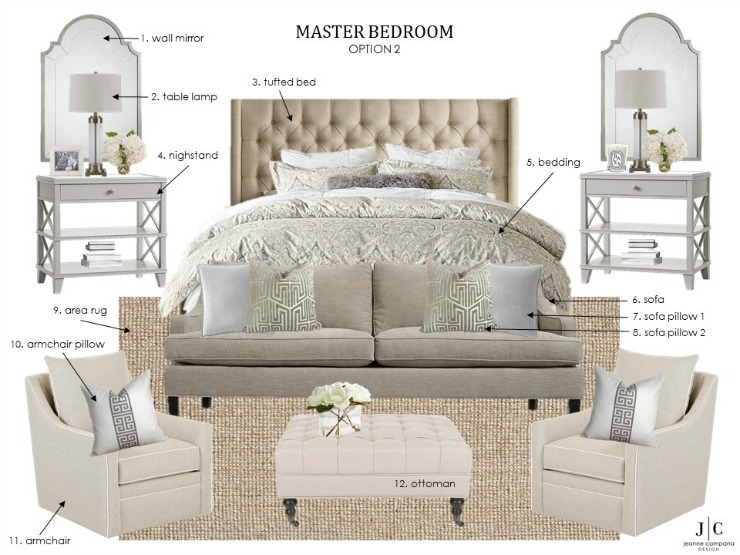 After reviewing all the plans, I always give my clients the option to mix and match furniture pieces but only one floor plan and one color palette will make the cut. Today, I will be sharing furniture and color palettes designs for client projects that didn’t make it into the final design. I hope to give you lots of inspiration so you can tackle your next decorating project with confidence. 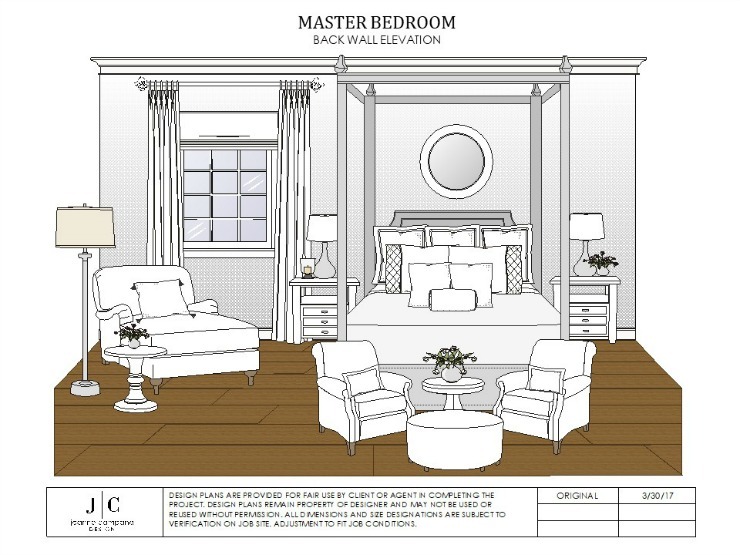 A new master bedroom is underway at my Spruce Avenue Project and I am thrilled with the progress so far. Quite a bit has changed since the initial presentation but this one was the winning design. (Final reveal and all the details are coming soon)! This option includes a neutral color scheme with varying textures and pattern. A comfortable seating area was placed in front of the bed to create a relaxing space for the entire family to enjoy while watching tv or curling up with a great book. This option has cooler tones of gray with pops of blue and silver metallic finishes. The neutral background serves as starting point for incorporating any color. Perfect for seasonal decorating, this option provides many possiblilties. 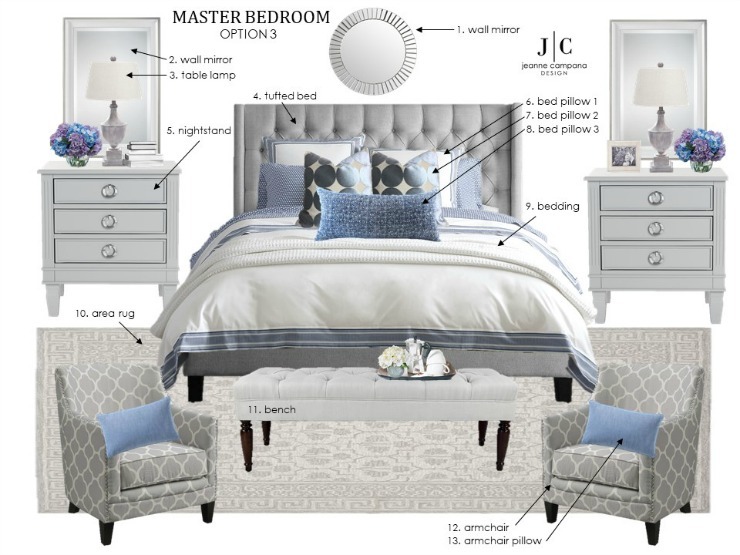 This master bedroom is fairly large so I incorporated a few vignettes as options in the smaller areas of the room. I even designed a fireplace to fit in the space. 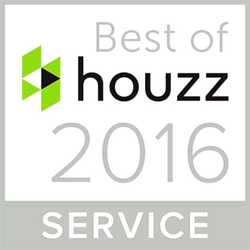 The homeowner loved it but due to budget constraints we had to remove it from the plan. 🙁 But the good news is…it can always be added on at some point in the future. 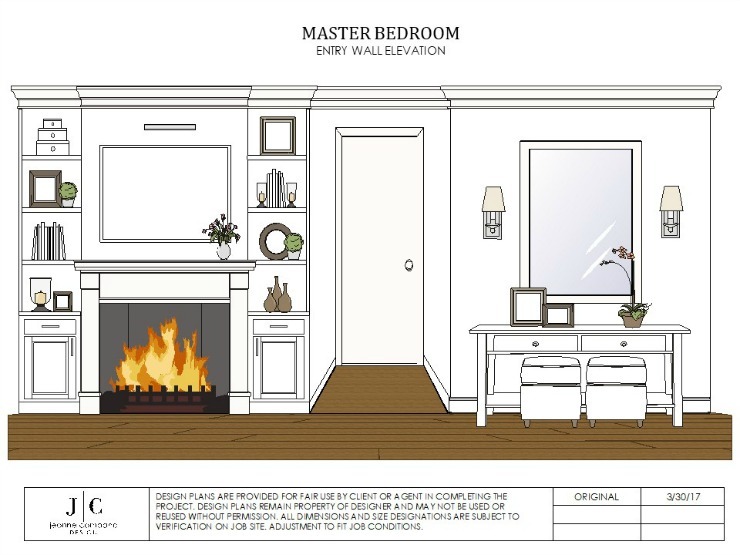 🙂 Here are a few elevations showing a custom designed fireplace and built-in as well as a corner sitting area with a comfy chaise lounge. 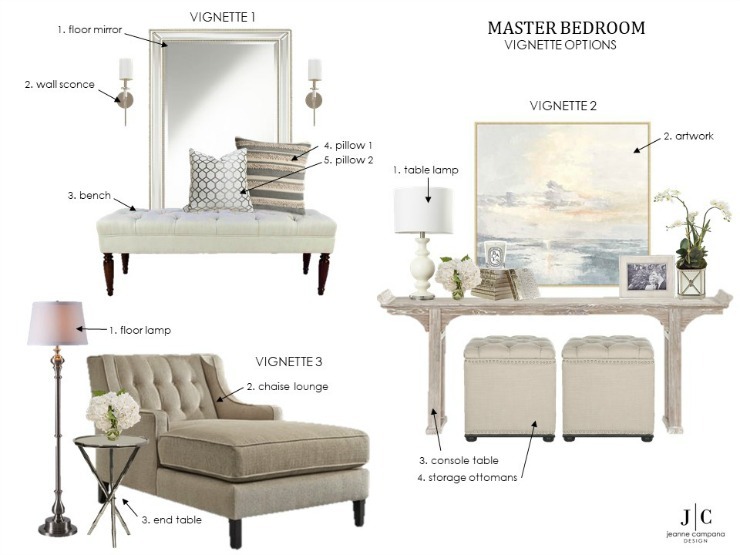 These vignettes were specifically designed for a bedroom but they can also be incorporated in any room of the house. They would work well in an entry foyer or in a corner of a family shared space. 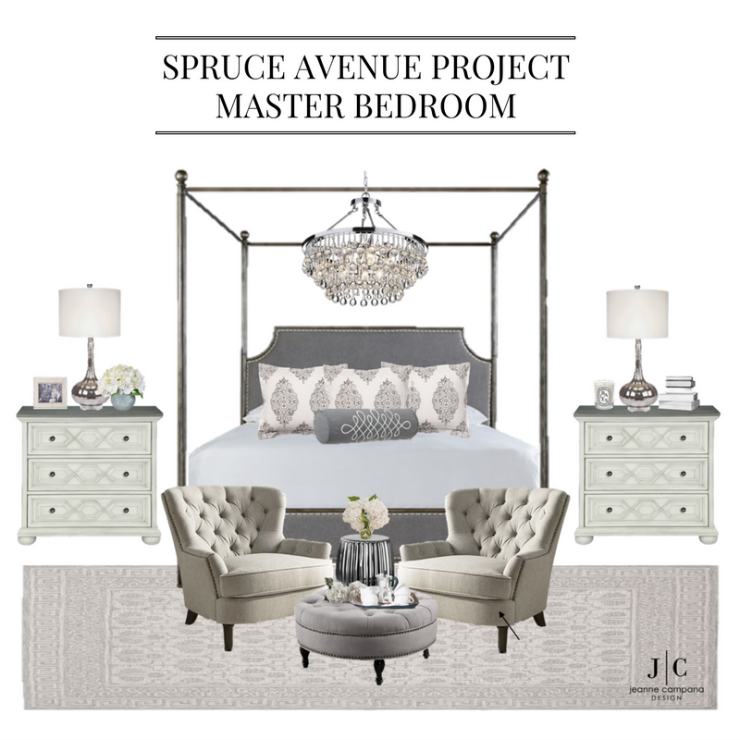 I am looking forward to sharing with you the completed master bedroom at my Spruce Avenue Project very soon. In the meantime, I hope I have given you some great ideas for your next bedroom decorating project. And if you decide to use any of these designs, please send me a photo. I would love to see!